We're a traditional barbershop in the heart of Winchester City Centre. We have created a shop with a vibrant atmosphere, incorporating WIFI for customer use, and Sky Sports HD for the enjoyment of all whilst they wait. From traditional barbering to modern trends, we pride ourselves in offering great customer service with all our team focused on continuing to develop their skills and raising the standards of barbering. We have a very experienced and talented range of barbers for all of your grooming needs. 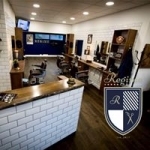 Have a look at "Meet The Team", on our website to find out more about our barbers. This place is a gem. Right next to the high street, reasonable prices and the best cuts in Winchester. My son always has Pete and we&rsquo;ve never been disappointed! Fantastic service! Highly recommend.